AmdoCraft is dedicated to training and equipping Tibetan nomads in the use of familiar resources and traditional artisan skills for small business. The nomads use yak and sheep wool, yak milk and local colourful braid to create exquisite products for you to enjoy. The profit from the sale of these unique hand made handicrafts goes directly to assist Tibetan communities. They are able to then provide shoes, clothes, and school books for their children as well as food for the long cold winter. This bag has been especially designed and made for children to use for the purpose of carrying books well. It fits books of all sizes, even large picture books. The handles are a perfect size for small hands and there is an attractive, smooth, large, easy to manage button closure to secure the bag. Each bag features a simple, felt and embroidered picture on both sides. 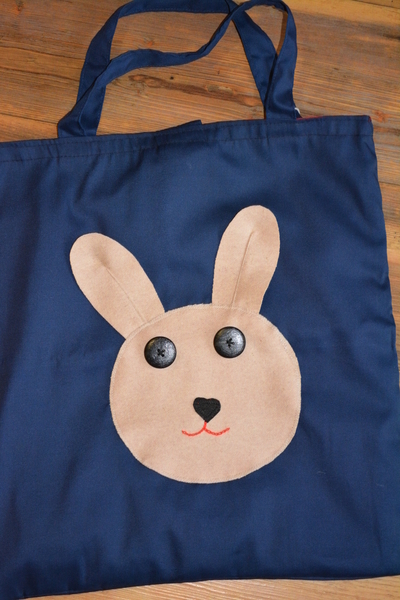 This library bag is made to last well and be a pleasure for children to handle. The bag is completed using heavy duty, quality, durable cotton fabric and is fully lined in a contrasting colour. Size: 44cm H x 40cm W.